Previous competitors GeoEye of Virginia and DigitalGlobe of Colorado operated independent fleets of sharp-eyed satellites to collect high-resolution images of the Earth's surface. But under the merger that closed Jan. 30, the two rivals will have a combined constellation of five Earth observation satellites and a broad suite of high-value geospatial production and analytic services. Under the revised plan announced Monday, the GeoEye 2 spacecraft will see its launch deferred at least a few years while WorldView 3 progresses as scheduled towards liftoff in the middle of next year to support the firm's EnhancedView contract to supply images to the U.S. government and the National Geospatial-Intelligence Agency. 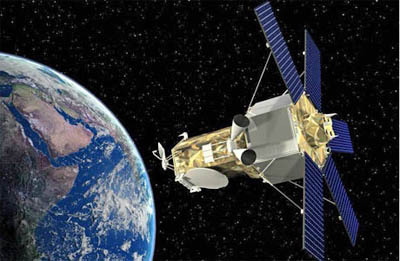 WorldView 3 was selected to proceed forward because it will have the capability to provide imagery in multiple short-wave infrared bands that can penetrate haze, fog, dust, smoke and other air-born particulates, officials said. "After careful consideration and discussions with our largest customer and others, we have determined that launching WorldView 3 and preserving GeoEye 2 as a ground spare will best meet the collective needs of customers and shareowners alike," said Jeffrey R. Tarr, president and chief executive officer of the merged company named DigitalGlobe. "This plan reduces our risk profile and capital footprint, while giving our customers access to the most advanced earth observation capabilities available commercially. Furthermore, as we move forward, if demand exceeds our expectations, we will be well positioned to quickly expand our constellation. GeoEye 2 and WorldView 3 are extraordinary satellites, and I want to thank all of our team members and partners for their continued efforts toward their completion." Ball Aerospace is building WorldView 3, which is designed to collect imagery at 31-centimeter panchromatic resolution, 1.24-meter multispectral resolution in 8 spectral bands and 3.7-meter short-wave infrared resolution in an additional 8 spectral bands. Flying at altitude of 617 km (383 miles), the satellite will be capable of collecting up to 680,000 square km per day, bringing the collection capacity of the DigitalGlobe constellation to over 4.2 million square km per day. Lockheed Martin is building GeoEye 2 to the specs of capturing panchromatic imagery at 0.34-meter resolution from an altitude of 681 km (423 miles). Officials said the satellite, which has been assembled and is undergoing environmental testing to simulate the in-space conditions it will face, will be postured to launch when a replacement is needed for the constellation or if customer demands require it sooner. The delayed deployment now gives United Launch Alliance a combined dozen Atlas and Delta flights this year. The first mission was completed successfully last week and the next is planned for Monday, Feb. 11 from Vandenberg.